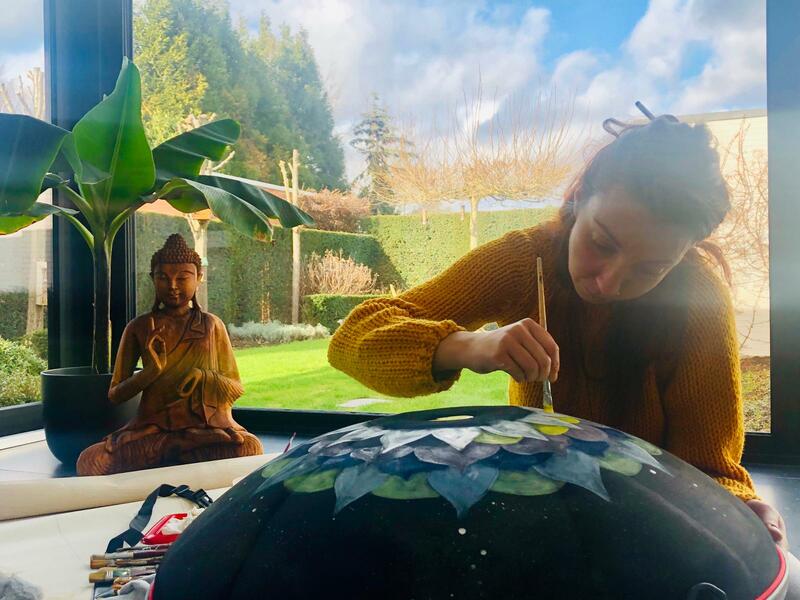 Getting her first commission for a painting at the age of 15, Pamela Marinelli, otherwise known as Pam Gogh, is a familiar (and ever-smiling) face in the handpan community with her beautiful hardcase designs. 👋Hey sister! It’s great to see you here at MasterTheHandpan.com. For those who haven’t met you yet, please tell us a bit about yourself. Yes… and no. I was practically born with a paintbrush in my hand. When I was a toddler, my mum let me paint on the walls of our home and I guess I just never really stopped. In high school, I earned the nickname Pam Gogh, after Vincent. I loved it and it stuck. That said, art wasn’t my first job. In my 20s, I didn’t really know what to do, so I tried many things. I was a barmaid, a waitress, a hospital toilet cleaner, a call centre operative, a fundraiser for the UN, babysitter, a kindergarten teacher, an IT teacher for prison inmates and an artisan in a glass workshop. Wow, that’s quite a lot! So how did you get into art? No matter what job I had, I always painted in my spare time. Every evening and weekend, I worked on commissions - walls and canvases, mainly. Inspired by Van Gogh, M.C. Escher, Frida Kahlo, Luis Tamani and Alex Grey, I got my degree in Fine Art from Florence in 2006, under the tutelage of an exceptional teacher Barbara Tosi. A few years after that, when I was teaching customers of an acrylics paint maker throughout Tuscany how to apply their paint and create art, I had the chance to rent the workshop next door to one of their shops in Livorno. So I set up by myself and taught Art there for 2 years. I had a great time! Then, in 2012, I got really sick and had to give it up. The following 2 years were the only period in my life that I didn’t paint. I spent time in Rome working for the UN, but I deeply missed being creative. So, I moved back to Perugia, became Buddhist and realised that art was not only my destiny but also my healing. 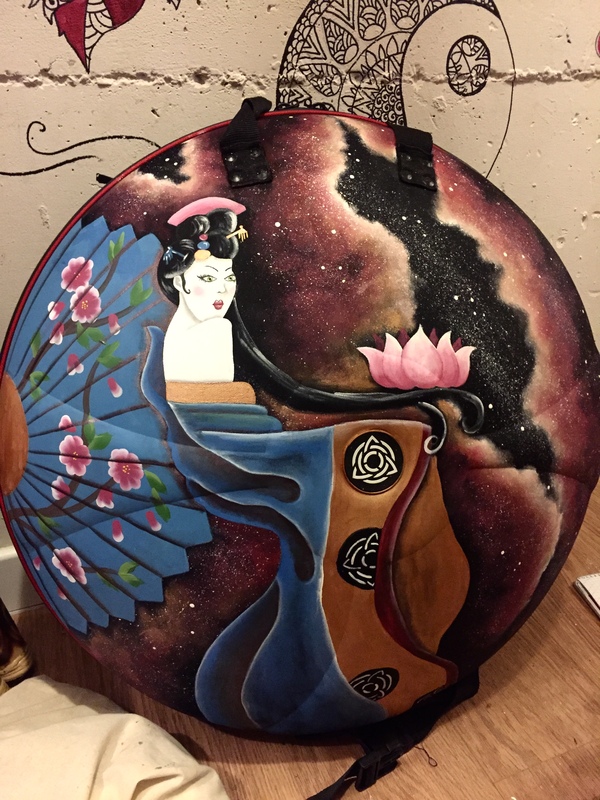 How did you start painting handpan cases? Well, by the end of 2014, I had quit my jobs, bought and restored an old camper and was driving around Europe selling my artwork on the streets, super-happy as a free spirit and independent artist. At the same time, I met my first handpan player. I fell in love with his MDR D minor, but I thought that such a beautiful instrument deserved to be held in a beautiful bag. So the following year, I approached Alessio from Hardcase Technologies (HCT) with a proposal to paint his Evateks. I did 10 for him and then left for India for 6 months to paint a guesthouse and go to my first handpan festival, not knowing if these cases would be popular. They all sold within one week. That was the start of my relationship with Alessio and Evatek. It’s been a crazy ride! Meanwhile, Kabeção (Carlos Rodrigues) saw one of these cases at Griasdi and called to ask if I could paint his house in Portugal. As a hero of mine, it was a very easy ‘Yes’ for me. We spent a week together, laughing, eating and jamming. I painted, he played - a private concert just for me. It was a magical time. One day, Kabe called one of his best friends, Yhonatan Ale-Yahav, maker of my favourite handpan, the Yishama. I offered to paint his Evatek as a gift. I’m so lucky that now I have a super-deep Yishama A2 hijaz that makes my heart go ‘Boom!’ I’m even luckier that both Kabe and Yhonatan have since become like brothers to me. ‍Sounds like you’ve travelled a lot! Where else has your journey taken you? Yes, with my life and paints in a rucksack, I’ve seen many amazing places! To date, I’ve painted more than 120 Evateks around the world. I have been to India, Morocco, Algeria, Kenya, the Sahara desert, Malaysia, Israel, Japan, New York and much of Europe. Such unique cultures have shaped who I am, given me new family and friends and influenced my art. Can you paint any customisation? Yes, I love the challenge of crazy and complicated designs! 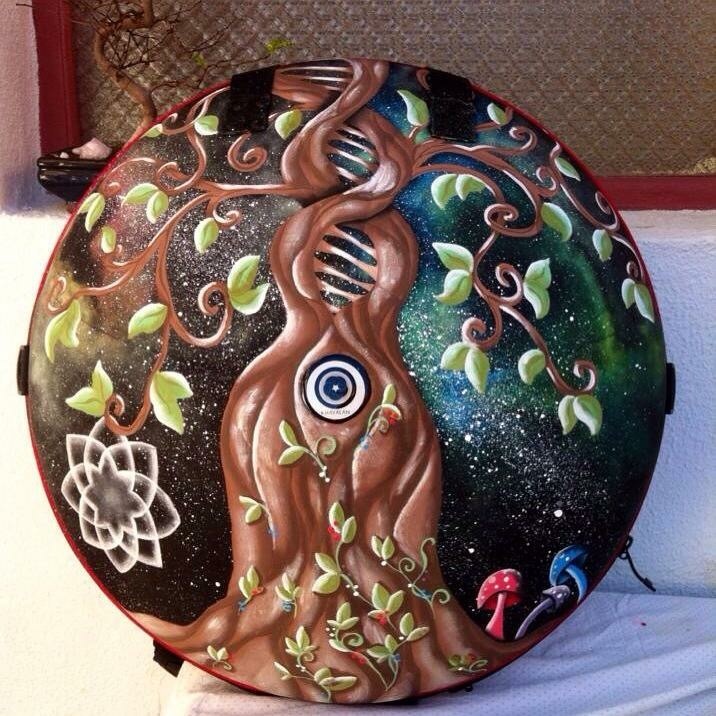 How do you paint handpan cases? I use the best quality acrylics which are waterproof and really durable. My work can take anything from 30 minutes for a simple company logo, to 3 days for layered and complex customisations, such as Yhonatan’s case. I’m really proud to have collaborated with Art for Heal, a therapy project created by an Israeli psychologist to help people to overcome trauma via expressive drawing. I’ve also worked as a volunteer with Colouring Life, painting the walls of hospitals and orphanages around the globe. On a personal note, I’ve survived both thyroid cancer and Crohn’s disease, which has given my art a whole new meaning as well as a very different philosophy to life, centred on a positive mind and natural healing. Since October, I’ve been developing skills as a tattoo artist, using vegan inks. I’ve met some really cool people! So, if we need some Pam magic in our lives, where can we find you? I’m super-excited to have a new home near Rome. This is an exclusive for you, David, because I’ve only just got the keys! It’s in a forest, right by a beautiful river – perfect for getting away from it all. After being on the road for so long, I cannot wait to grow some roots. I’ll be using it as a base for retreats and therapy projects, as well as longer-term art projects. Throughout the year, I’ll also be drawing flyers for various handpan festivals, painting at the festivals and doing collaborations with musicians as an illustrator, as well as my ongoing work as an interior designer and tattoo artist. 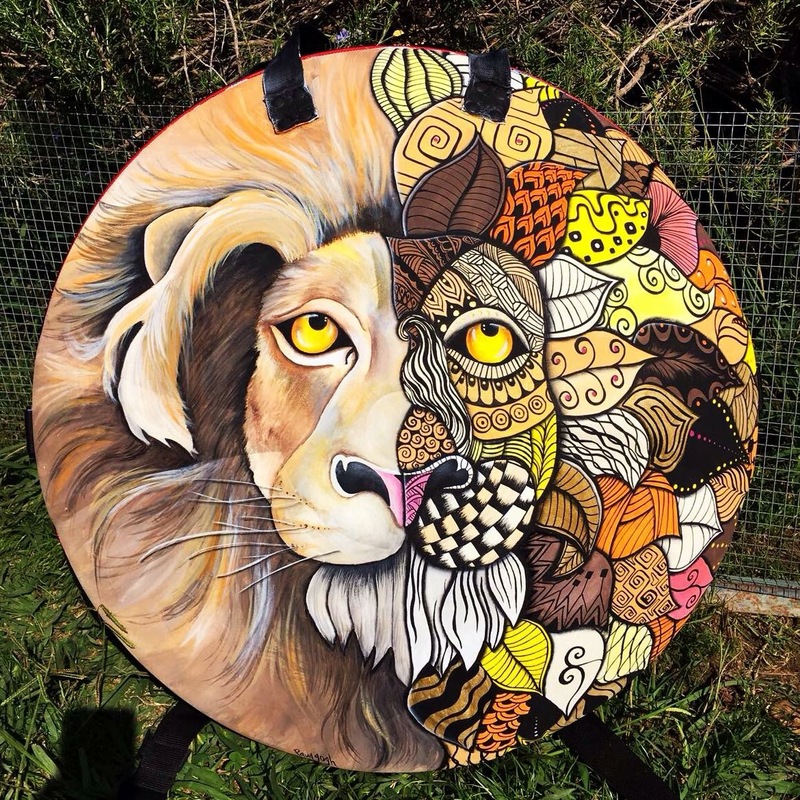 March: Santaram, Portugal - Handpan Festival – painting hardcases. April: Israel – another wall mural and some tattoos. May: HONA, Naxos, Greece – conducting my first handpan case painting workshop. That’s as far as my diary goes at the moment – I generally like to see where the wind takes me! I cannot wait for the festival season to meet up with old friends and make new ones. Thank you so much Pam – it’s been really cool to get to know you better. 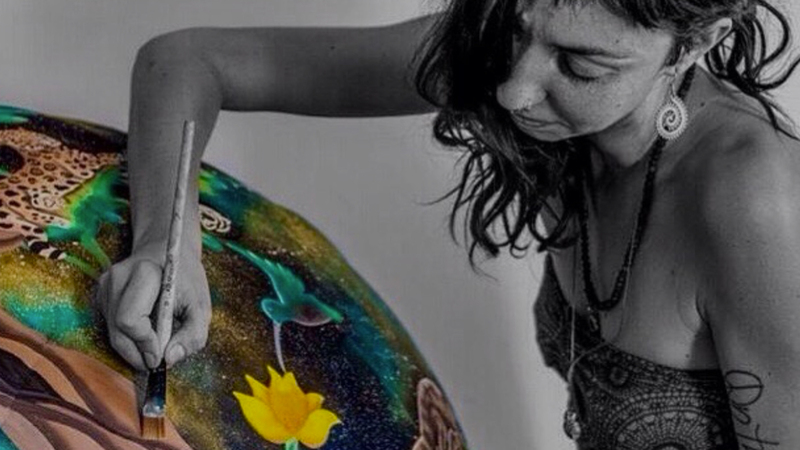 ‍If you guys want to talk to Pam about a commission, you can contact her through her website: www.pamgogh.com or stay in touch via her Facebook page to see which festivals she’ll be painting. 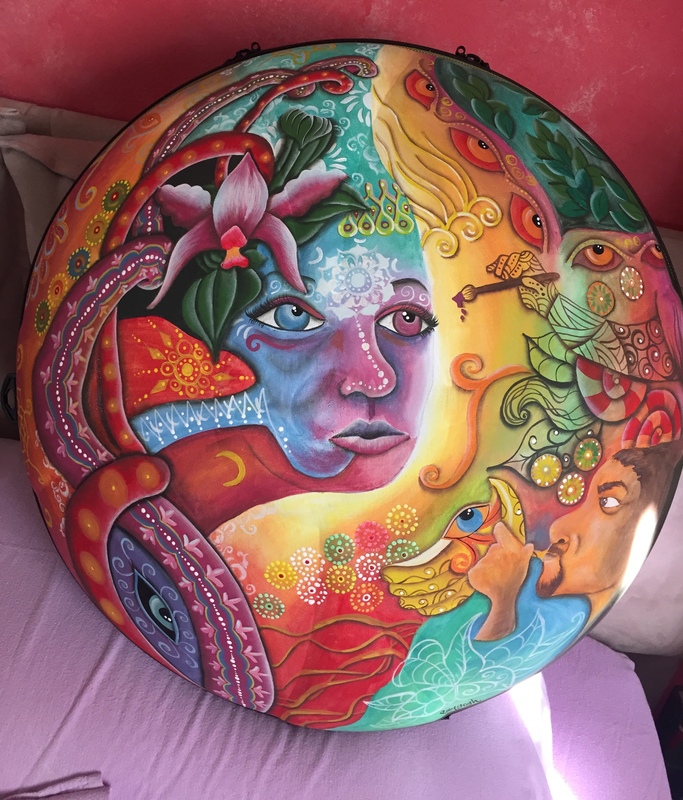 You can also reserve your spot on her handpan case painting workshop at HONA 2019 in May.